Built in 1992 and seating 164 patrons, the Thrust theatre is named after the thrust stage at its center. The space offers a variety of staging options and encourages interaction with the audience. The Thrust theatre is built around a converted warehouse facility, which provides a traditional blackbox style lighting and rigging grid system within an intimate, thrust stage environment. The Thrust Theatre houses two dressing rooms each complete with a private bathroom, sink, and shower. This studio contains 1,050 square feet of rehearsal space equipped with a sprung wood floor for acting, movement, and dance work. 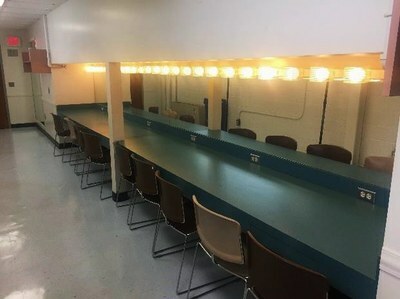 This rehearsal and classroom space comes equipped with stock acting furniture, chairs, and wall-length mirrors to aid in the rehearsal process. 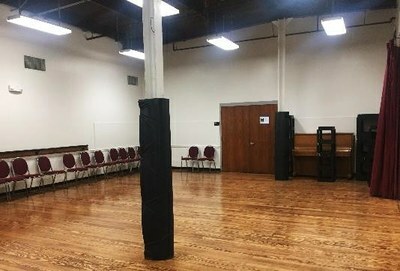 This space is used for classes, mainstage rehearsals, Studio Theatre’s student productions, and it is available for individual student use for acting, directing, movement, and voice classes. 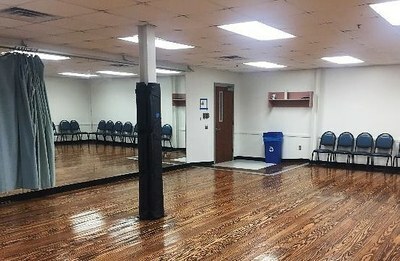 This studio contains over 1,300 square feet of rehearsal space equipped with a sprung wood floor for acting, movement, and dance work. In addition, this space contains 250 square feet of storage for mainstage rehearsal storage and movement equipment. This rehearsal space comes equipped with stock acting furniture, chairs, piano, and wall-length mirrors to aid in the rehearsal process. 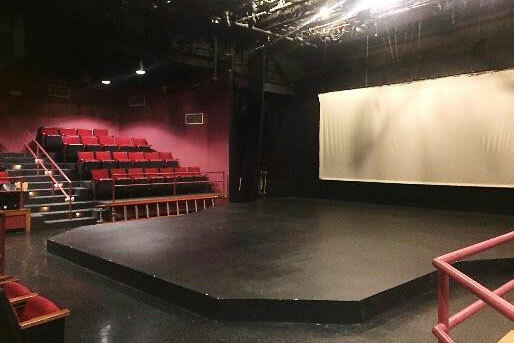 This space is used for classes, mainstage rehearsals, Studio Theatre’s student productions, and it is available for individual student use for acting, directing, movement, and voice classes. 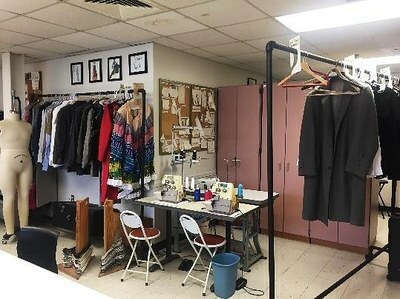 UofL’s costume shop offers training to students of various levels of experience. Our students begin working on instructional-level machines and eventually graduate to industrial machines used in professional theatres. Finishing machines, such as industrial-grade sergers and irons, allow for professional finished work. Adjacent to the shop is our laundry and fabric dye facility, where students learn how to mix color and create their own dye samples. 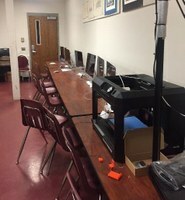 The Design Lab includes 12 iMac desktop computers, a large format plotter for printing design materials and drafting, a tabloid color printer, and a 3D printer. Analog technology includes 8 drawing and drafting tables for sketching, costume design painting, and model work. This is a multi-use space that houses many of our technical theatre and design courses, which utilize the drafting tables and technology the room has to offer. The Department Box Office is housed in the lobby of the Thrust Theatre. 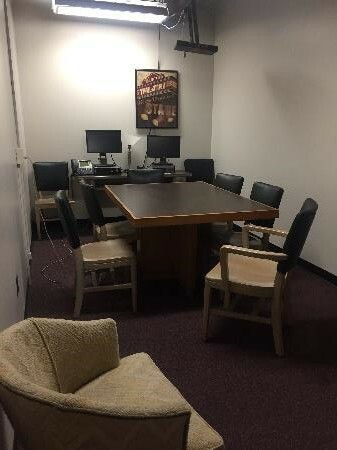 This facility is used be students who are working as house managers during a production, as well as by work-study students and graduate students who work daily in the Box Office. All UofL students know that the best price can be obtained by coming directly to the Box Office during normal business hours (10am-4pm). On afternoons and evenings of performances, the Box Office will be open for an hour prior to each performance at the appropriate venue. This Production Meeting and workspace can seat eight people and has projection and computer media for displaying design work and production materials. 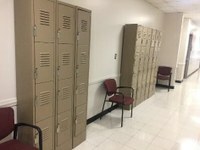 There are many student lockers available to store student movement gear, workout clothes, and other materials. Students may claim a locker for the academic year. All locks must be removed by the end of each academic year.